Resembling purple honeycomb, this unique silicone exfoliation tool allows for deep, intense cleansing, washing away impurities and unclogging problem-prone pores. Pair with your favourite cleanser to promote a clearer, refreshed complexion. Exfoliate your way to a clearer complexion with Nurse Jamie’s Exfoliband Silicone Loofah. 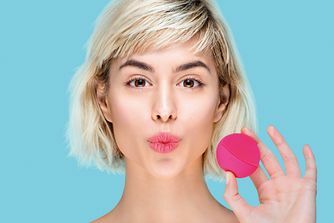 Crafted from anti-microbial silicone (to resist the beastly bacteria that traditional loofahs can harbour), this unique exfoliation tool utilises a hexagonal structure to offer deep, intense cleansing. The nifty little loofah is simply slipped onto the hand and can be flipped inside out to alter exfoliating texture – the outer side is designed for normal to oily skin, while the inner side has a softer, less abrasive feel for sensitive to dry skin. Pair with your favourite cleanser and massage in circular motions to wipe away impurities, combat congestion and reveal a renewed, refreshed complexion. Apply your favourite cleanser to the Exfoliband and massage into damp skin, making circular motions. Use the outer side for normal to oily skin or flip inside out for sensitive to dry skin. Love this - also a great glitter remover. I bought this about a year ago, I don't use it every day, but when I do it leaves my skin really soft and clean feeling. The rougher inside is a bit too rough for my face, but sometimes I use it on other parts of my body. More recently I've discovered that it's a great tool for removing glitter after nights out! It’s literally amazing! Feels like a mini facial at home. Keep my skin looking great on hols! Cleaned my skin really deeply despite all the SPF I was slapping on! Love love love!